This designer chiffon dress would be perfect as a bridesmaid dress or as a fun party dress to wear to an upcoming dance or cocktail party. 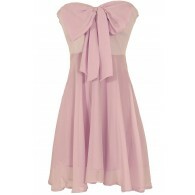 The Stella Beaded Shoulder Chiffon Designer Dress is fully lined and made entirely of chiffon. It has a crossover V neckline and empire waistband. The bust is made of pleated chiffon. The best part of this dress has to be the detailed bead embellishment at each shoulder, giving it a touch of sparkle. A hidden back zipper completes this dress. The Stella Beaded Shoulder Chiffon Designer Dress would look great paired with pumps or strappy metallic heels and some pretty jewelry. Details: Fully lined. Hidden back zipper. 100% polyester. Lining: 95% polyester, 5% spandex. Dry clean only. Small measurements: Length from top of shoulder to hemline: 32”. Bust: 34”. 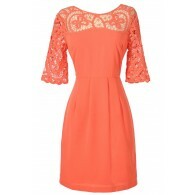 You have added Stella Beaded Shoulder Chiffon Designer Dress in Coral into Wishlist. You have added Stella Beaded Shoulder Chiffon Designer Dress in Coral for Stock Notification. 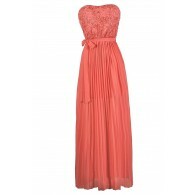 You have set Stella Beaded Shoulder Chiffon Designer Dress in Coral as a loved product. You have removed Stella Beaded Shoulder Chiffon Designer Dress in Coral as a loved product.